Kids enemy No 1 in law & order debate – or the main victims? PHOTO: We chatted with this group of youngsters yesterday and they were happy for us to take this picture. It was a nice Saturday morning in the Mall, and they were hanging out together, having fun. One boy, clearly suspecting that people would think they are up to no good, said: “Are you going to give this photo to the police?” Another said he would look up the story at school on Monday and took the Alice Springs News Online website address. A third boy, when asked where he is from, replied: “Alice Springs. I own it.” One boy said, with a big laugh: “My name is Damien Ryan.” We’ve obscured their smiling faces because there was no opportunity of getting formal permission. We’re sorry about that, and will be happy to provide the un-redacted picture to the boys. 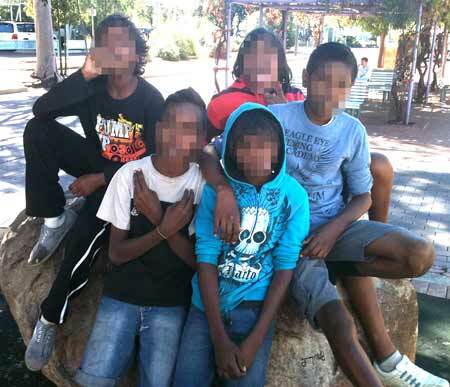 Down here on the ground in Alice Springs, black children, driven to crime by hunger and fear, are fast becoming enemy number one, or victim number one, depending on who you’re talking to. There’s not much public knowledge about just who these kids are, nor how many of them there are. We have a land, sea, men’s, women’s and all manner of other councils, but do these kids have a voice? Here’s a look at a couple of current initiatives: are they going to make a difference? The drunks “send in the kids. For the kids it’s excitement,” a burgled restaurant owner explained during the recent town council election campaign, dominated by law and order issues. The loot was a few bottles of spirits. The cost of smashed property was in the thousands. “We’ve had $1800 worth of damage done here and all they took was bread and cheese,” said a candidate seeking re-election. Meanwhile up there in the stratosphere, the Australian Lawyers for Human Rights (ALHR) are making submission to the Attorney-General’s Department Public Consultation on the Third Optional Protocol to the Convention on the Rights of the Child (CRC) which is a new United Nations (UN) communications procedure for individual children or groups of children to submit complaints regarding specific violations of their rights under the CRC and its first two optional protocols. That means those children in Central Australia who don’t know which bed they will be sleeping in tonight, whose drunken parents spend money on booze rather than food, those children who are rarely sent to school, as young as 10 roaming the streets of A Town Like Alice in packs of 30 or 40 at 2am, who are routinely and with impunity denied the necessities of life, kids who climb on a roof, jemmy an airconditioner off its mountings, get into the roof cavity through the shaft, breach the ceiling, steal food or booze, those kids will – if their government signs the Third Optional Protocol – have access to a “process allowing complaints to be made by groups of children or on behalf of children [that] is different to other UN communication procedures that require individuals whose rights have been violated to make the complaint themselves. This type of process demonstrates the importance of a unique communications procedure for children that is more understanding and better suited to their special needs”. And that’s not all the good folk in Canberra are doing for the kids risking their lives playing cat and mouse with the cops on the hills and in the streets and the dry creeks of Alice Springs. Jenny Macklin, Bill Shorten and Julie Collins are working on “a new flagship program for youth, [namely the] Remote Youth Development and Leadership Corps for people aged under 25, [which] will provide 3,000 young people each year with a clear pathway to employment”. The trio is doing this the only way they know how: chuck vast amounts of money at it. The Remote Jobs and Communities Program starting on July 1 next year will cost $1.5b to “provide a more integrated and flexible approach to employment and participation services for people living in remote areas of Australia”. It’s worth spelling it out: one thousand five hundred million dollars. Again, it’s unfathomable how this relates to the reality on the dusty ground of The Centre. Centralian Advocate, February 24, 1966: “Two more groups of Aborigines from Central Australia have left Alice Springs to obtain seasonal employment as fruit pickers in southern states. 15 Aborigines from Hermannsburg Mission had left last week to pick fruit in the Clare district of SA. “A second group of 20 Aborigines from Santa Teresa Mission had left Alice Springs at the weekend to pick tomatoes on a large property at Griffith, in NSW. “Once they had gained experience, these Aborigines were expected to earn up to [the print here is fuzzy but it looks like] 10 pounds a day while working a six day week during the harvesting season. Alice Springs News Online, September 15, 2011: “The Rocky Hill vineyard last year produced 1000 tonnes of table grapes. At $3 to $4 a kilogram that’s worth $3m to $4m. “The pruners and pickers are each year recruited from a contract labour firm in Mildura. These days they are usually Asians. They make their own way to Alice Springs, some 2000 kms. They stay at the workers’ quarters, look after their own food and are paid by the box. Back to the ’60s, a clipping – again supplied by Mr Nelson – from a book about camels in Australia, published in 1969: “Australian Aborigines are not noted as owners and users of livestock. Despite the fact that they make excellent stockmen and, as such, are essential to the progress of the cattle industry of the northern half of the country, and although they are sometimes talented workers with sheep or swine, it is a valid generalization that Aborigines do not often own or use animals other than dogs. “However, it was noted that many Aborigines took advantage of the opportunity to acquire camels during the period of their release by Afghan and white owners. “Camels are mainly used by the Aborigines for personal transport, and especially on walkabout greatly enhance their owners’ mobility. In some cases dromedaries are put to other uses. “If the Aboriginal has a trade or a job that requires the movement of heavy materials, such as sandalwood-gathering, he can profitably employ his beast. And an increasing use for Aboriginal-owned camels in the tourist areas of central Australia is to provide amusement for visitors, in the form of rides and photographs, for a fee. “By the end of next financial year, $19 million will have been spent and of the targeted 350,000 feral camels, a mere 36,000 were exterminated in the first two years. “The cost per head of shooting the camels from helicopter had blown out, with the latest provided estimated being about $212 per head, plus direct operation costs, whatever they might be. “Surely it is time for the authorities to … try something else – such as capturing the more accessible camels and transporting them to abattoirs. So what do the initiatives promoted in the 60 page NGO report Listen to Children, the subject of Mr Keim’s release, have in common with the newest opus of Ms Macklin, Ms Collins and Mr Shorten? • blind to the fact that services provided at massive public expenditure are futile unless there is a reciprocal effort from the recipients. The Listen to Children report was written after consulting more than 750 children and young people around Australia – including in Alice Springs – and more than 100 organisations and subject matter experts, and a workshop in Melbourne in November 2010, attended “by 40 of Australia’s notable child rights practitioners”. Surely, existing knowledge of the misery is plentiful for resolute and meaningful action to be put in motion right now. The report finds that despite ratifying the Convention on the Rights of the Child in 1991, “Australia has not effectively incorporated human rights into policy and legislative frameworks to nurture and support Australian children. The report is especially critical that Australia has not fully adopted Article 4 of the convention adopted by the United Nations in 1989. In essence that article requires that governments assess their “social services, legal, health and educational systems, as well as levels of funding for these services. “Governments are then obliged to take all necessary steps to ensure that the minimum standards set by the Convention in these areas are being met. That is as far from the Central Australian reality as Canberra’s Remote Jobs and Communities Program. Whatever slice of its billion and a half will be spent in The Centre, much or most is likely to be wasted. One of local employers’ major complaints it the difficulty to find labour – skilled or unskilled. Interstate job hunters arriving in Alice find work almost instantly. Their problem is likely to be accommodation. So why are all able bodied Aboriginal town camp dwellers, who’ve just received $150m worth of housing at no cost to them, not off to work every morning? The Canberra trio will give us a Community Action Plan: What job opportunities will that include that are not staring us in the face right now – including cattle, horticulture, tourism? They will “help people get ready for work” says a media release: How hard it is to pick grapes at Rocky Hill and watermelons at Ali Curung – where reportedly backpackers from overseas are currently doing the work? The Federal program “will focus on providing work-experience in jobs that are available in or near their community. For example in mine regeneration work, office work, farm or station work, building and maintenance and environmental land management.” These jobs are available right now. Why aren’t they taken up? The program will have a “No Show No Pay” rule: people who fail to participate will have their payments suspended. A spokesperson for Ms Macklin says that will extend to the dole as well: people who do not participate in the Remote Jobs and Communities Program will not have the easy option of staying or going back on the dole. When considering the government’s likely resolve in enforcing this measure, it’s worth keeping in mind that the dole has been paid for decades notwithstanding countless job vacancies in The Centre. If that measure puts an end to the rorting of unemployment benefits over generations, and get people into work and a mindset of looking after their kids, then it will be worth the billion and a half dollars of taxpayers’ money. PHOTO above: Broken window in the Town and Country pub in Todd Mall, now temporarily closed after poor trading and a string of break-ins. Thanks for this Alex. A great story by Erwin. You were certainly right about employment in fruit picking down south. Around 1965-66 fellows from Ernabella went down to Berri for fruit picking. Just before I started at Amata in 1964, a group of men from there had been up at Snake Bay on Melville Island working in the timber industry. Re the camels, when we were at Docker River in early 1970s, Dennis Wickham, whom you may have known, came through with camels on his way to the WA coast. A couple of older men who had worked at Angus Downs and Tempe Downs could have told Dennis all he wanted to know about camels – they were the experts. • Under the Intervention Centrelink made some local changes to the obligation of looking for jobs and taking them when they are offered. 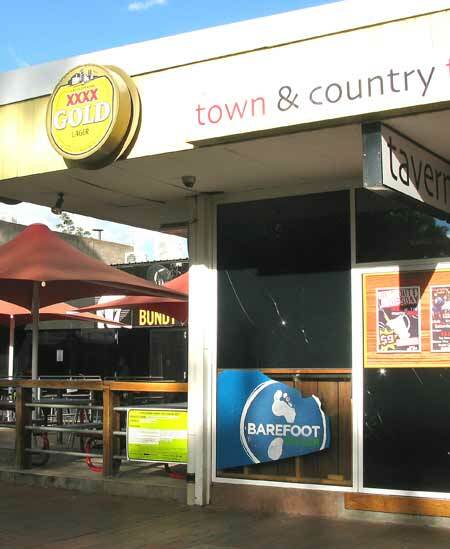 See reports by KIERAN FINNANE, Slowly moving to growth towns and Bush ready for work change. • Bob Beadman is one of the most insightful commentators on the subject, including his final report, December 2010 to May 2011, as the Northern Territory Coordinator General for Remote Services. • See Job creation, Gillard style: The spin and the real world for an account of the difficulties in getting meaningful information, from Centrelink, about the number of unemployed people in specific locations. Update April 30: Fresh statistics are now available (see below) which refer to smaller regions. However, the regions are still too big to plan for businesses to which workers can commute daily. The figures below relate to the regions above. The unemployment rate rose in all areas between 2010 and 2011. 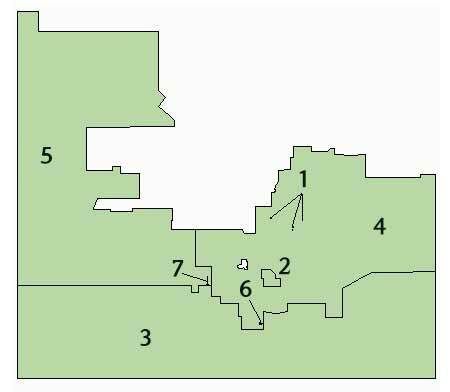 The small white patch above the number 6 is Alice Springs. @conncernedalice resident you displayed well your lack of knowledge of our town. Small business do not feed on the suffering of indigenous people that is solely owned by aboriginal companies and offices. No one wants to lose their healthy incomes so there is no desire to fix and problems or issues. No it is always about those ensuring the denigration of a race of people to either make the payroll greater. Real facts mate not interstate BS. I find it funny how people comment on they way indigenous people behave in town. I seem to recall quite a few people in town have profited greatly from these indigenous issues, ie repairs and maintenance of houses in communities. If it wasn’t for the need to support the locals none of us would have any reason to be here. This issue is far bigger than any of us fully understand and there is no solution, as we are 40 years too late and there is nothing in the Territory to count as a industry power house. Small fish in a small fishbowl..And it is usualy the case that those who shout the loudest about law and order are the most corrupt. Alice Springs is the proverbial can of worms regarding dirty deals done dirt cheap. PS: Don’t yell to loud, the world is watching this place with great interest. It is going to get very interesting here in the NT, so strap your selves in boys and girls, the fun has only just begun. Ray, @ May 5 2012 at 9.29am. Can you consider posting with your surname as per the Editor’s recommendation? We’ve had several Steves and now we’ve got several Rays. Everyone else at this post has done it. @”Ray” Good on you Ray your actions of two nights ago may well have saved someone’s life. I think before order can be restored in Alice we must get a local call centre and extra very literate staff to reduce the paperwork load of the police. For better and for worse, the Alice is a unique case. A call centre from Darwin was NEVER going to work. @melanie. The comment that Janet could have made a report to the police in the time it took to write her post demonstrates a clear misunderstanding of the issue. The whole point is it takes ages to get through to the police, and even longer for them to turn up. A few years ago I had to tackle an 18 year old youth who was speeding off his head. We had him pinned to concrete for 45 minutes while waiting for police to attend. He had already assaulted one person and was threatening others. The police had been informed of this and still it took ages. Two nights ago a blind drunk Aboriginal woman sat down on the double white lines on Larapinta Drive. Waited four and a half minutes before the police even took my call from the 000 operator. Melanie I am at a loss how people like yourself get off on the pain and suffering of ours. What are you saying that you support the people on the street breaking into homes, damaging property and causing injury pain and suffering and injury to others. And if you bothered to read you would have read my idea for a web site to assist not only police but victims of crime. Taking and removing unnecessary trauma from their lives. So tell us all where do you stand – with decency or against it. And people like you support the destruction of our town. Janet it occurs to me that you could have reported this alleged crime in the time it took to write your post. I sympathise with those who want to see more done to protect themselves and their property from vandalism. I have experienced gratuitous damage to my family’s vehicles and bikes several times over the years. However, I can’t help but think that it is not necessarily just children performing these frustrating and frustrated crimes. It also occurs to me that the cost of enforcing a curfew capable of dealing with most of the problems would be so enormous that it would be much wiser to invest big in effective prevention and interventions. Effective preventions would include more mandated participation in effective parenting skills courses by naive and neglectful parents, and a much better range of youth activities and facilities, including a really good, large, multi-functional youth centre. Interventions needed include intensive case management of the ring leaders and the most anti-social of the ‘at-risk’ juveniles and offenders, and targeted interventions with their parents. It also should include integrated, community-wide efforts to make sure school-age children are attending classes. These measures need to be implemented in a number of remote bush communities which have entrenched problems of youth crime and disorder, as well as in Alice Springs. Rather than creating a large professional army of police and security guards to guard the very large number of potential ‘hot spots’ into the wee hours of every night, in Alice and in the larger remote communities, we should be investing in small mobile teams of such forces, but not at the expense of an emphasis on the preventative measures outlined above. Growing up in a town camp I saw a lot of issues affecting young people.Such as family violence, alcohol abuse, drug abuse and intoxicated behaviour. I have a solid understanding of social issues, affecting Aboriginal communities such as, the intervention into child protection in the Northern Territory, the alcohol restrictions within the Alice Springs community and income management. I’ve taken it upon myself to advocate for the well being of indigenous people living in the town camps, in particular for the children who are at risk of harm though alcohol abuse, neglect and family violence. We are now victims of the angry juvenile child / children who delight in causing deliberate damage to someone else’s personal property. Our car was parked at the rear of council whilst Steve was at council meeting Monday night and when Steve came out after the meeting to find the right hand rear of our car kicked in. Very severe damage. A youth curfew would have ensured our vehicle along with many other vehicles damaged by this and similar groups of angry youth would never had happened. Please if you have had your vehicle damaged please add to this article. No use reporting to police. Between work and personal time we do not have hours to spare making reports. Here is an idea how about a police web site that people like us can log this type of report and confirm a time to met with a police officer to view the damage. We can afford insurance, most cannot. This damage is frustrating and inconvenient. To others it is devastating to their living standards and lifestyles. Time for youth curfew to be discussed again. And consider the victims first and little concern to the perpetrators of such damage. Time for protection for the people of the town from these children who have no respect for anyone not even themselves.